The main document to work through for the VCAP-DCA is the Availability Guide but there are plenty of good white papers and blog posts which give useful background information (see the bottom of this post). If you have access to the 2010 VMworld content it’s worth watching session BC8274 which covers most of the material on the blueprint. Firstly you have to make sure your host hardware will support FT – it’s more demanding than many other VMware features. The main requirement is to have Intel Lockstep technology support in the CPUs and chipset. Rather than list the processor families which support FT you can read VMwareKB1008027. Hardware virtualisation must also be enabled in the BIOS (not always on by default). You need to ensure the guest OS and CPU combination is supported (as the Availability Guide states, Solaris on AMD is not for example). No snapshots – this also means no VCB or any other backup technology which relies on an underlying snapshot. VMwareKB1016619 describes how you can do backups using templates or storage array level snapshots. Both seem pretty awkward and far from ideal. So what features are supported? NOTE: DRS is only available if EVC is enabled. If you disable EVC there is a warning that features such as FT with DRS will not work. The main requirement is for an additional GB capable NIC for FT logging. 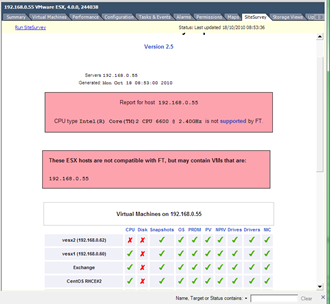 Sharing vMotion and FT logging (as in the screenshot) might be OK in a lab environment or on 10GB NICs. This is simply done from the context menu for the VM. If the prerequisites aren’t satisfied the option will be greyed out. If the VMDK files are thin provisioned they will be converted to eager-thick-zeroed when you enable FT on the VM. For large VMs this could take a considerable time. You can see affinity rules which keep primary and secondary on separate hosts. Turn off – the secondary is deleted. Use when the change is permanent. VMwareKB1008026 details these options. You can enable a CPU reservation (which is then applied to both primary and secondary) if you’re concerned about contention with other VMs (an FT-enabled VM will automatically have a full memory reservation). Remember that FT-enabling a VM adds a second running VM, hence extra resources are being used. The hosts in the cluster should be of similar spec and performance (otherwise a secondary VM may not keep up with a primary VM or vice versa). This also enhances chances of compatibility. This is a best practice for VMware clusters in general but doubly so for FT. The FT-enabled VMs should be spread between the available hosts to avoid overloading either logging NICs or host CPU. By default you can’t run more than four FT-enabled VMs on a given host anyway. 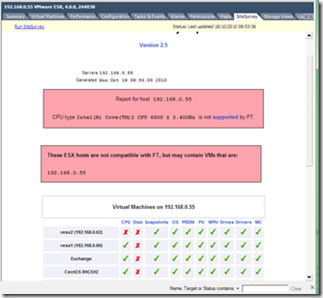 Use identical power management and hyperthreading features on hosts used with FT. Typically disable power management. You can change the NIC teaming policy to better utilise multiple NICs for FT logging. See VMwareKB1011966 for details. Some people have been successful running virtual FT ie running virtual ESX hosts and enabling FT on a nested VM, but I couldn’t get this to work in my lab, even though the physical host’s CPU was compatible.